Have you ever had a brilliant idea for something? It comes to you all in a flash – the most wonderful invention, which you’re sure nobody could have ever thought of ever. Like that time I invented these little colorful plastic blocks that fit together so that you can build something and then take it apart and build something else. What?!? Legos?!? D’oh! Anyway, the other night, in the middle of the night, I was having trouble sleeping. So I tried to distract myself from worries by thinking about what I could make the next day to go with my drunken puttanesca sofrito. Something sweet and bright to go with all of that intense flavor. Of course I thought of parsnips! But what to do with them? Croquettes? Nah, just did that. Pies? Someday, but not just now. Then it came to me! Gnocchi! Nobody would ever have thought of making parsnip gnocchi, right? Well, it turns out other people have thought of it. But I still invented them! Others may have done so too, and hooray for them. Here’s Parsnip Snips by Michael Hurley, a regular on the 60s Greenwhich Village folk scene, and friend of the Unholy Modal Rounders. These would also work with pureed butternut squash, pumpkin, sweet potatoes, carrots, etc, although you might want to alter the herbies. 1. Drop the parsnips into salted boiling water and boil for about 20 minutes, till they’re soft but not completely mushy. Purée them – you should have about 1 cup. 2. Put the milk and butter in a saucepan with the thyme, mustard and white pepper. Bring to a boil, and take off the heat and stir in the flour, all at once. 3. Add the eggs one at a time, beating well so that they’re thoroughly mixed. 4. Stir in the parsnip puree. 5. using two teaspoons, drop the batter by spoonfuls onto a baking sheet that’s been lightly greased. They’ll puff up, but they won’t flatten out like cookies, so you don’t need to leave more than about an inch between them. 6. Bake at (preheated) 400 for 20 minutes to half an hour, till they’re puffed and starting to turn golden brown. 7. Serve with the sauce of your choice! 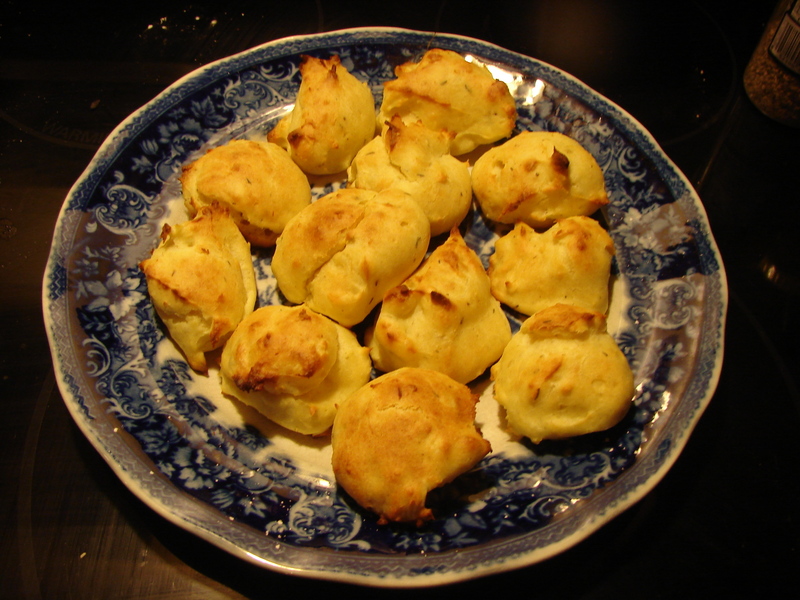 This entry was posted in recipe and tagged baked gnocchi, parsnip dumplings, parsnip gnocchi by Claire. Bookmark the permalink. imma gonna do this very soon. as soon as the weather gets cold I’m craving parnsips daily. An excellent idea, wish I’d thought of it!